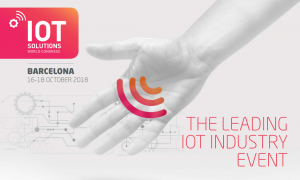 From the 16th to the 18th we will be in Barcelona at the Internet of Things Solutions World Congress, working in partnership with Deloitte, who have asked us to be present on their stand with them. It is due to our strong working relationship with Deloitte, as well as our knowledge of Industry 4.0, that we have been asked to share their stand with them. With us we are bringing a Sawyer, which we have programmed to function as an interactive game. If you’re a fan of the classic “hook the duck” game at a carnival, then you’ll definitely enjoy this! To make things even better, we will have two fluent Spanish speakers on the stand so can speak with anyone who may be interested in our automated solutions, or who just want to have a go at our game. The Internet of Things Solutions World Congress is an event dedicated exclusively to joining IoT providers with industry in order to help the latter increase productivity via this disruptive technology; it is the annual meeting for industry stakeholders to establish new partnerships. The platform is to connect with key decision makers, making us flattered that Deloitte have invited us to share their stand with them. If you’re also going to IoT then why not stop by stand 437 and have a go at our hook the duck game!